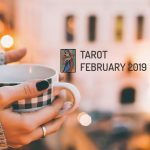 In Tarot for February 2019, Temperance is the arcana that dictates how the month will go and invites us to take advantage of life in a balanced way. Temperance is a word derived from the Latin word temperantia, which referred to the moderation of temperature. Over time, this moderation was used also to describe a virtue, an effective way of living. Socrates, as well as Plato and Aristotle, took it into account and spoke about it in their writings. In tarot for February 2019, this card represents the middle ground between boredom or sloth and unstoppable desires. It is an arcana that does not try to keep the pleasures of life away from us, but actually wants us to enjoy them so long as they are properly measured. Act with a head on your shoulders because extremes always lead to disaster. Thanks to temperance we can manage our thoughts, actions or needs in a coherent and balanced way. The image that represents Temperance on its card is that of an angel, a spiritual entity that is halfway between God and men. It is holding a cup in each hand and it passes the water within them, from one to another without spilling a drop. The symbology of this action indicates to us that after the Death card, Temperance is number fourteen, the person has been reborn and has new hopes, so you should take stock of their various feelings. That is what the movement of water between the two glasses reflects, the control of our emotions, which are represented by water. We control them so much that we do not spill anything. The appearance of the angel is ambiguous, it could be a man or a woman, which also serves to represent the balance of opposites. In tarot 2019 for February, Temperance is a positive card that allows you to transform negative cards. With it, we will feel divine protection much more strongly during this month, the presence of the guardian angel. Interestingly, sometimes such a function will be exercised by ourselves, by finally controlling our overindulgences and insecurities. With regard to health, it represents a beneficial card that indicates that we are going to be cured if we are sick. It also serves as a recommendation at other times to moderate both our eating and drinking if we want to lead a healthy life. Business will have a positive outlook and money will flow. However, we must always act out of prudence, not fear. On a sentimental level we will enjoy a corresponded love, recovering those forgotten feelings that cooled the relationship. Talking and reflecting together with your partner will help to consolidate love.